It was a pretty rough week, things were more stressful at work than they probably needed to be, or maybe I just wasn’t prepared. It doesn’t matter now – that work week is over and I’m resting up for the next one! By Friday night, I was ready to collapse in a pile and be done with it all. I was so far gone I didn’t even want a drink or dessert – I just wanted to run away. That is ultimate stress for me – not to sound like I rely on my Friday evening cocktail – but not wanting it is a sign I need some serious re-group time. So I decided to just let it go, and prepare to take a kick-boxing class Saturday morning at the gym. What better way to get out frustration than punching and kicking?! Problem was, the studio for class was being refinished so all classes were canceled for the weekend. Frick! I went for a long run and pushed myself to run most of it. I felt pretty good by the time I got home. I needed to get out for the day. To go be alone and recharge and I wasn’t sure when I was going to come back. I drove up to the Anacortes Art Festival. I used to go every year, but not so much recently. It was good, I’m glad I went. Saw some good artisan work and some, well, eh. I ran into a friend of mine that is a jeweler and spent a little bit of time catching up and meeting her daughter. After walking through the whole festival twice, I was ready to go. But it was only 4:30 and I wasn’t ready to head back down to Redmond. Still too much energy inside. I side tracked to Deception Pass. I used to go up there frequently when I was single. It was an easy hike, and there are beaches to sit and meditate on. I hadn’t planned on hiking so didn’t have the right shoes or even a backpack. Still I walked down to the beach and spent about a hour sitting in the sun, listening to the water break on the rocks. 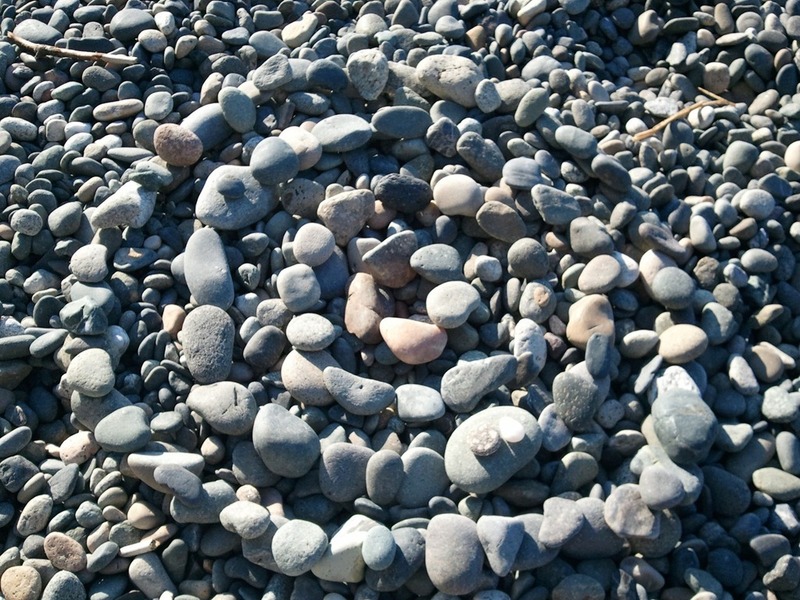 I put together my own spiral, it helped calm my mind. There is nothing like a beach and water to help calm me. I’m not a mountain person, I don’t like camping, nature and I have a tentative relationship. Except for water. I could never live in the Midwest and be so far from an ocean. When I think about my retirement, I see my house being near the water, close enough that I could walk down to get the kind of recharge I had yesterday. 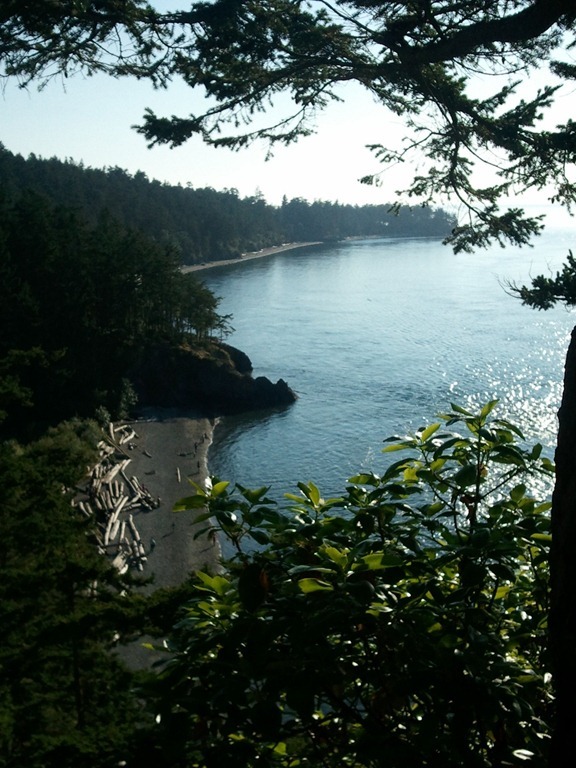 So here is a personal reminder to myself – that when it all gets to be too much, I don’t have to drive 90 minutes to Deception Pass (although a good option) – there are many beaches around town that I could escape. Some close enough to take a lunch break, some far enough that no one could just “drop in” on me.